The United States Sports Academy recently hosted local military veterans for a presentation, tour and luncheon on the campus in Daphne, Ala. Seated, from left, are Mawk Arnold, Fairhope, Marines; Jim Jeffries, Daphne, Army; Tom Murray, Mobile, Army; R.L. Constantine, Mobile, Navy; James Bailey, Mobile, Army; and John Walker, Spanish Fort, Marines. Standing, from left, are Academy Dean of Academic Affairs Dr. Stephen Butler, Daphne, Air Force; Bruce Terry, Mobile, Army; David Sprott, Mobile, Marines; Garrett Tirpac, Daphne, Coast Guard; James Pitts, Spanish Fort, Army; Pat Flannagan, Chatom, Army; Academy Trustee Dr. Nick Niccolai, Mobile, Navy; Academy Founding President Dr. Thomas P. Rosandich, Daphne, Marines; John New, Daphne, Army; Jim Younce, Mobile, Navy; Dr. Turner Rogers, Mobile, Army; Ed Ramey, Mobile, Navy; and Warren Ross, Irvington, Air Force. 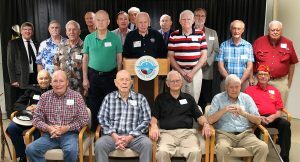 DAPHNE, Ala. – The United States Sports Academy recently hosted a campus luncheon and art museum tour for local military veterans, including two who served in World War II. Dr. Thomas P. Rosandich, a former Marine who founded the Academy in 1972, told the group about the institution’s mission to serve the nation and the world as a sport education resource focused on upgrading sport through programs of instruction, research and service. He also talked with the veterans about the Academy’s American Sport Art Museum & Archives (ASAMA), home to more than 1,800 works of sport art across a variety of media, including paintings, sculptures, assemblages, prints and photographs. The veterans were also given a presentation on the Academy’s academic programs by Dean of Academic Affairs Dr. Stephen Butler, a 24-year Air Force veteran, who noted that numerous members of the Academy’s faculty and staff are veterans. Among those attending were two World War II veterans – Mordecai “Mawk” Arnold of Fairhope and R.L. Constantine of Mobile. Arnold, a retired U.S. Marine Corps major, grew up and currently resides in Fairhope. He served in the Marines for 34 years starting in 1943, with his career encompassing World War II, the Korean War and the Vietnam War. He began military service as a radar technician and then moved into public affairs. After retiring from military service in 1977, he taught communications and public relations at the college level, including at Auburn University, Troy University and the University of Miami. Arnold, who was Fairhope’s Veteran of the Year in 2012, said he is always thankful when organizations such as the Academy honor veterans. “Events like this are a wonderful reminder to us that we are veterans and that there is a great appreciation for our service,” Arnold said. “Dr. Tom Rosandich, who is also a retired Marine, has also supported and provided meeting space for the Marine Corps League, which involves active and retired Marines in many service activities, including providing support for the Toys for Tots program over the years. “I think the art collection at the United States Sports Academy is unbelievable and Dr. Rosandich has done an incredible job putting this together. You will not find another museum with such good sport art and such a wide international collection as the Academy. People in our area should really come out and look at it. Constantine held the rank of U.S. Navy Fireman 1st Class in 1945-46 in the Philippines, where he worked as a motor machinist on a floating drydock. A fourth-generation Mobilian, Constantine enlisted at age 17 after graduating from the McGill Institute, which later became McGill-Toolen Catholic High School. “I was part of the crew that maintained the boats the Navy drydocked there in the Philippines, which had been occupied by Japan,” Constantine said. He returned home to Mobile in June 1946 and attended Spring Hill College, where he studied business administration. He then worked in the finance industry with his father for 12 years before embarking on a 28-year career as a life insurance agent.